Start a project today, no need to call ahead! We offer Pottery Painting, Mosaics, Glass Fusing, Wax Hands, and Spin Art all day long, every day of the week. Schedule lessons in Wheel Throwing, Canvas Painting, or Pallet Board Painting too! New 6 Week Wheel Throwing Classes! 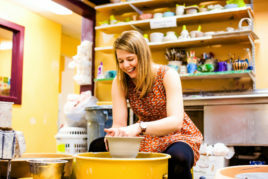 Learn how to create mugs, bowls, cups, vases, and more on the pottery wheel! Bringing a Group? Make a Reservation! 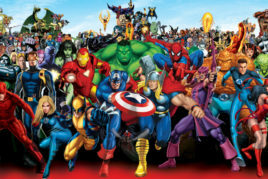 Join us Thursday, May 30th at 6pm for a Superhero filled night! Tons of Superhero designs to choose from! We Can Bring the Fun to You! 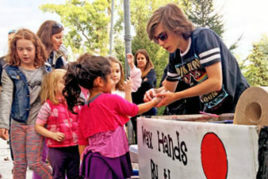 Wax Hands and Spin Art are perfect for Bar/Bat Mitzvahs, Communions, and School Events! We offer awesome art programs for Schools, Senior Living Facilities, and Rec Centers! "Creative Arts Studio just brings the awesome. 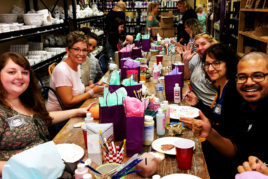 You can paint pottery there (they have dozens and dozens of items to choose from), make a mosaic, create jewelry, and other creative things." "Went there for the first time today. It is hard to find places where two 13 year olds and a 6 year old can enjoy the same activity. They did different crafts and all had a nice time together. Friendly staff and casual atmosphere. Already planning our next trip!" "This place is great for all kinds if occasions, especially kids birthday parties! Wonderful staff and the kids have a ball!" "I was there with my three young children today for the first time. It was a great experience! Plenty to choose from for painting, friendly staff and very relaxed atmosphere. We will definitely be back." I was there yesterday for Mommy and Me painting. It was the perfect activity for a toddler: cheap, quick, and lots of fun! The staff was well organized and had everything setup. A great way to spend a fun morning. It was my first time visiting yesterday and we REALLY enjoyed it!!! The staff was very friendly, helpful and the environment was peaceful. We will DEFINITELY be back!! !